Join us for monOrchid's new exhibition opening reception party for Michael Viglietta. 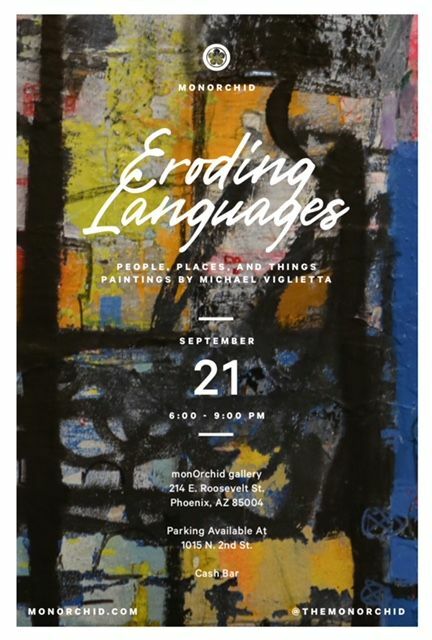 PHOENIX - Sept. 11, 2018 - PRLog -- Join us for the opening reception of monOrchid's represented contemporary abstract artist Michael Viglietta. "Eroding Languages: People, Places And Things" will showcase on Friday, September 21st from 6:00-9:00 PM with a cash bar and parking at 1015 N. 2nd St.
With a background in television and movie production, the New York born artist eventually shifted gears to pursue his passion of painting. Between layers of materials and the words, numbers and sayings scattered within, Viglietta creates a unique dialogue between each painting. In it's entirety, Eroding Languages is driven by Viglietta's observations of the spaces around him; shaped by courage, frustration, joy and fear. The process of building up acrylics, plasters, wax and paper clippings allows for him to process the perplex world he finds himself in - discovering answers as he creates. "Eroding Languages: People, Places And Things" will be displayed at monOrchid Gallery until December 7th.